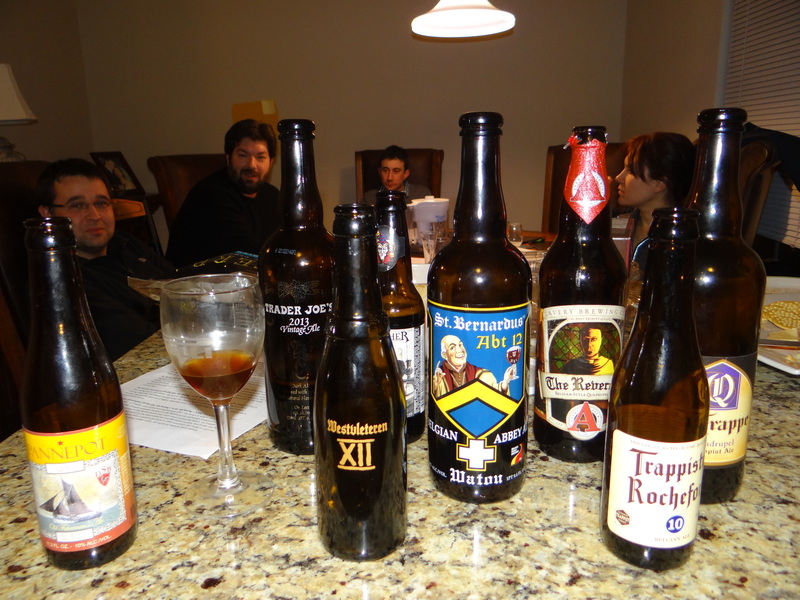 In Round 1 we compared four American brewed quads, with Three Philosophers coming out on top. In this round, we move across the pond to Belgium and the Netherlands where this style of beer originated. There are two Trappist beers (Rochefort 10 and La Trappe Quadrupel), one abbey ale brewed with the old Westy 12 recipe (St. Bernardus Abt 12), and one beer brewed by a relatively new secular brewery (Pannepot by de Struise). Westvleteren XII may hold the #1 spot on the BeerAdvocate list of best quads, but the four beers competing in this round and variations on those beers hold 8 of the next 10 spots. The winner of this round will join Three Philosophers and Westvleteren XII in the final round. Rochefort 10 (11.3% abv, BA Rating = 4.52, RB Rating = 4.31, $6 for an 11 oz bottle) This is one of the oldest Trappist Breweries with operations dating back to 1899. They brew three beers labelled 6, 8 and 10 which are 7.5%, 9.2% and 11.3% abv. 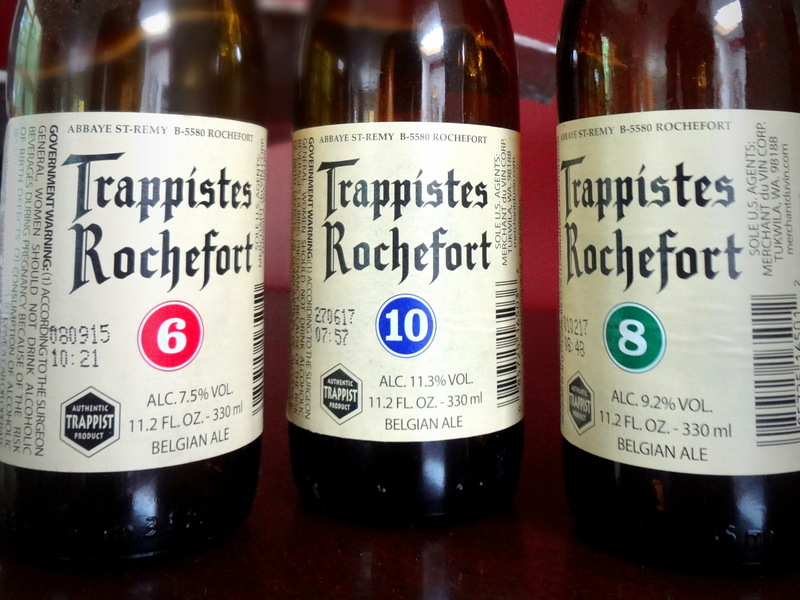 Rochefort 10, is the second highest rated quad on both BeerAdvocate (BA) and RateBeer (RB), behind Westy 12. Coming into this contest it was my favorite quadrupel ale. The bottle we were drinking was recently purchased and was bottled in late June, making it 6-7 months old. St. Bernardus Abt 12 (10.5% abv, BA Rating = 4.47, RB Rating = 4.15, $11 for a 25 oz bottle) After WWII the monks at Westvleteren turned to a nearby secular brewery (Deconink) to commercialize their beers, and that brewery was renamed St. Bernardus. In 1992 this arrangement ended but St. Bernardus continues to brew Abt 12 with the Westy 12 recipe, so in essence this is as close as you can get to the original Westvleteren XII. Since that time the recipes have diverged a little and Westvleteren has adopted a yeast strain from their fellow Trappist brewery, Westmalle (see the post on “I think about beer” for more details), but many people would agree that St. Bernardus Abt 12 is the closest substitute to Westvleteren XII that you can find outside of Belgium. The bottle we were drinking was given to me as a gift in December 2012 (thanks Jenni) and thus was about 1.5 years old. De Struise Pannepot (10.0% abv, BA Rating = 4.37, RB Rating = 4.21, $7 for an 11 oz bottle) Among the Belgians this is the young kid on the block. De Struise Brewery, which is located quite close to the Westvleteren and St. Bernardus breweries, only came into existence in 2003. 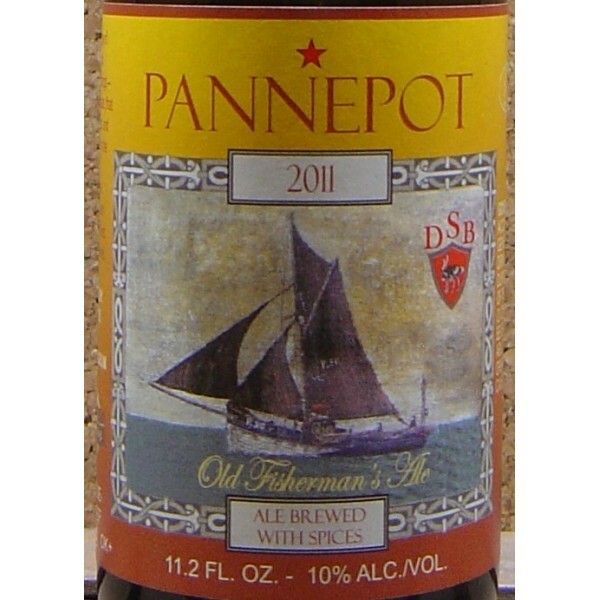 Despite its youth their strong, dark ale, Pannepot, named after the fishing boats of West Flanders, has quickly become a highly regarded beer. This beer is brewed with spices and is described by the brewer as falling somewhere between a Belgian strong dark ale and a stout. The bottle we were drinking was recently purchased, but it was a 2011 vintage and so was 2.5-3 years old. I have not seen any bottles in the store yet of a more recent vintage than 2011, so presumably the brewery ages them before they are released. Rounds 1 and 2 took place on the same night. As described in the round 1 post the judges were my friends and co-workers Josh, Hannah, Anita, Tom and Chris. My wife Laurinda attended and helped out with the pouring so that we could do a true blind taste test. Several of us had previously tried St. Bernardus Abt 12 and Rochefort 10, but the other two beers were new experiences for all of us. Pannepot – The upstart steals the show, Pannepot came in as the top pick on five of the six ballots. An opaque deep brown color, Pannepot is the darkest of the four beers we encountered in this round. Chocolate flavors from the roasted malts are more prevalent in this beer than in any of its competitors. The roasted malts are masterfully blended with a big helping of dark fruits (plums, prunes, figs), and accented with spices (particularly cloves). The raisin character that is so typical of Belgian quads is present, but less dominant than in either the St. Bernardus or the Rochefort. To top it all off it has a silky smooth mouthfeel. The brewers claim that this beer falls somewhere between a quad and a stout, and after drinking it I have to agree. If you like big beers and have not tried Pannepot you should fill that gap in your life experience at your earliest opportunity. 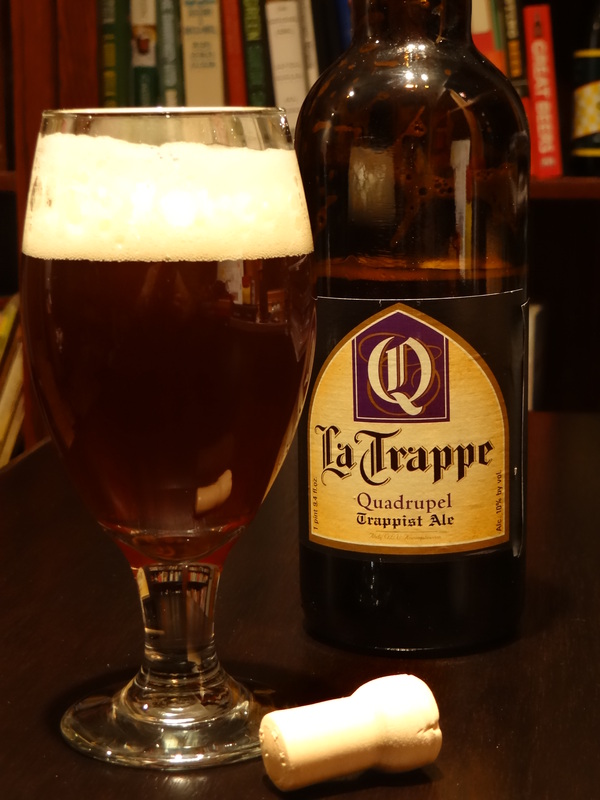 La Trappe – This beer was the runner up to Pannepot, nabbing one of the top two spots on five of the six ballots. It was distinctively different than the other three beers in this round. It is a deep golden, amber color with ruby highlights and after uncorking the bottle it pours with a big head of creamy white foam. There is roasted, caramel-like maltiness on the nose along with distinct Hefeweizen-type notes of banana and bubble gum that are not present in any of the other Belgian quads. The caramel richness of the malts also comes through in the taste along with accents of lighter fruits (peaches, apricots, bananas). There are enough hops to keep things from becoming too sweet and the alcohol is extremely well hidden. Spicy, black pepper-like phenols emerge at the finish. The lack of dark fruit character makes it a little different than what I’ve come to expect from a quad, but maybe I’ve been expecting the wrong thing. 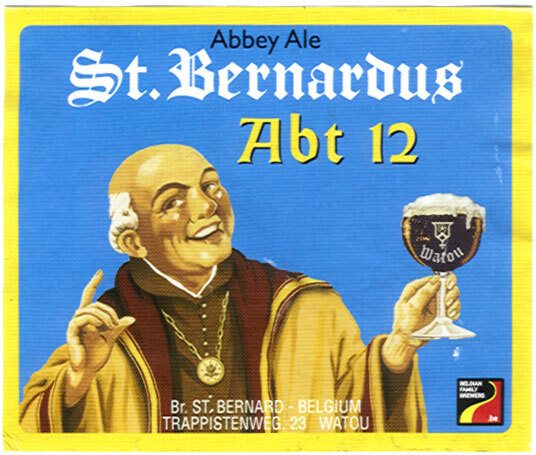 St. Bernardus Abt 12 – This beer is a deep amber color that is not quite opaque, but does come with quite a bit of suspended particulates, presumably from the yeast. It has the dark fruits of the Pannepot but not the chocolate from the roasted malts. Although everyone found raisin in the nose and the taste, different judges detected different flavors that compliment the dark fruit/raisin backbone. Josh and Chris perceived honey. Anita and I both detected the presence of vanilla, while Tom and Hannah both noted a resemblance to Dr. Pepper. There was a consensus that the mouthfeel was thinner and more carbonated than the Pannepot. No question this is a classic take on the Quadrupel Ale style, but against this stiff competition it was not able to rise to the top. Rochefort 10 – Before the night started I would have been willing to bet that Rochefort 10 would come out on top when the dust cleared. Imagine my surprise when the beer identities were revealed and I found out that everyone, including myself, rated Rochefort at the bottom of the four beers in round 2. The color is darker than the St. Bernardus but not as dark as the Pannepot. My description of the taste was raisins early, followed by a cola-like taste mid-palate, finishing a little hot. It does have the highest abv of the four beers and was notably younger than both the Pannepot and St. Bernardus we were drinking, both of which might help to explain the fact that it came across as more boozy than the other quads. Pannepot took the dark fruit aspect of the quad and married it with the roasted chocolate malts of a stout, accenting the union with clove notes from the yeast. There was a near unanimous consensus that this twist on the classic style was in fact better than either the St. Bernardus or the Rochefort. Consequently it will be the beer that moves into the final round. 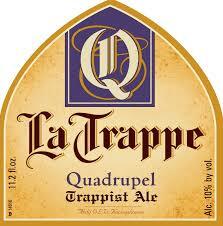 The La Trappe quad was distinctly different from the others and undeniably delicious. It combined rich caramel from the malts with the banana and bubble gum nose of a Hefeweizen. St. Bernardus was probably the truest realization of what I would describe as the classic version of a Belgian quad, with a taste dominated by rich dark fruits, particularly raisins. Rochefort 10 surprisingly finished in last place in this round, in part because it seemed to be more boozy than the St. Bernardus. A bottle that had more age on it may have been able to match up with the St. Bernardus better but I don’t think it could move ahead of the Pannepot and La Trappe with this panel. Now that the dust has cleared Pannepot will be joining Three Philosophers in the final round where they will square off against the legendary Westy 12. Don’t forget to tune back in and see which beer emerges as the King of the Quads.